On January 20, 1775, French physicist and mathematician André-Marie Ampère was born, after whom the unit of measurement of electric current, the ampere, is named. He is generally considered as one of the main founders of the science of classical electromagnetism, which he referred to as “electrodynamics“. André-Marie Ampère submitted his first work on solving the problem of constructing a line of the same length as an arc of a circle to the Académie de Lyon at the age of 13, but it was not published. The young polymath also grew his interest in history, poetry, philosophy, as well as natural science. Ampère’s father was executed in 1793 after the fall of Lyon during the French Revolution as a Girondist (he had previously arrested and executed a leading Jacobin in Lyon, Joseph Chalier, as a judge of the peace). André-Marie Ampère was devastated and quit his studies for over a year. At the age of eighteen he studied the textbooks of the Swiss mathematician Leonhard Euler and the classical mechanics of Joseph-Louis Lagrange. At the same age he developed a planned language which he regarded as a peace-building tool. 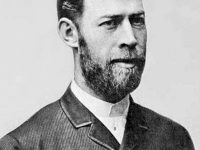 He also turned to botany, metaphysics and psychology before studying mathematics and physics. After the parental fortune had melted, he gave private lessons, especially in mathematics. His contacts with the outside world, however, were limited, until he met Julie Carron, whom he fell in love with and he finally began his first job as a mathematical teacher. 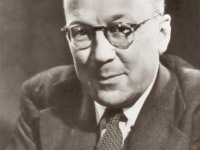 Unfortunately, Carron did not develop the same feelings for him at first, instead she mentioned that “He has no manners; he is awkward, shy and presents himself poorly.” Nevertheless, they married shortly after and everything began to work out for the young scientist since their son was born soon and he was appointed professor of physics and chemistry at Bourg École Centrale. The happiness did not last very long, since Julie became seriously ill. Still he mastered to accomplish several goals in the field of mathematics and earned himself a reputation that was at least good enough to financially take care of himself and his son after Julie passed away. In 1802 he became a teacher of physics and chemistry at the École centrale in Bourg-en-Bresse. In the same year Ampère wrote a mathematical work on a probability-theoretical aspect of gambling, namely the question of the probability of the player’s ruin with the steady use of a fixed fraction of his capital. The work made him famous among scientists in Paris. Soon afterwards he wrote a paper on theoretical mechanics and a treatise on partial differential equations, which earned him membership of the French Academy of Sciences (then Institut Impèrial) in 1814. He made important publications on the theory of light before combining theories of electricity and magnetism in the early 1820’s. In the early autumn of 1820, Ampère, who was now 45 years old and whose previous scientific work would have appeared only as footnotes in textbooks, became aware through François Arago of Hans Christian Ørsted‘s attempts to deflect a magnetic needle by electric current. Ampère repeated the experiment and recognized that Ørsted had not considered the deflection of the magnet by the earth’s magnetic field. With an improved test arrangement, Ampère was now able to determine that the magnetic needle was always perpendicular to the conductor through which the current flowed. Ampère now assumed as a model hypothesis that every magnetism was caused by electric currents and that currents generate magnetic fields. 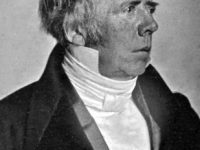 He tested his hypothesis – hypothetically-deductively – between September 18 and November 2, 1820 and was able to prove in successive experiments that two current-carrying conductors exert an attraction force on each other when the electrical current direction is the same in both conductors and that they exert a repulsive force on each other when the current direction is opposite. Ampère constructed a device for measuring current, which he called a galvanometer (regardless of Ampère, Johann Schweigger did this in Germany). André-Marie Ampère refined his hypothesis by assuming that each magnet contains many molecules, each generating a small circular current (Ampère’s molecular currents to explain magnetism). He recognized that the flowing electricity is the actual cause of magnetism. In 1822, Ampère studied the force between two close conductors. He was able to show that this force was proportional to the reciprocal value of the distance. In the mathematical treatment of these phenomena, he took Isaac Newton‘s law of gravity (as the law of point force) as a model. However, since the current must be treated as a directional quantity and the current strength contains time as a new quantity, Ampère’s model has only limited validity. Ampère explained the concept of electric voltage and electric current and fixed the direction of the current. In addition to establishing electrodynamics, Ampère recognised the principle of electric telegraphy (proposal of an electromagnetic telegraph with Jacques Babinet in 1822), which was not very practical over long distances. André-Marie Ampère published his most important and most influential work was published in 1826. It was made public under the name ‘Memoir on the Mathematical Theory of Electrodynamic Phenomena, Uniquely Deduced from Experience‘ and described four experiments and a mathematical explanation of the electrodynamic force law. It became one of the most inspiring contributions to the sciences of electricity and magnetism, which influenced not only Michael Faraday , but also William Thomson  and James Clerk Maxwell  and numerous physicists of the future. In 1827 André-Marie Ampère’s health deteriorated and he turned from electrodynamics to other fields (philosophy, logic, anatomy, crystal optics, botany). In philosophy he was influenced by Kant and was even one of the first in France to receive his work seriously. For Ampère this was an alternative to Étienne Bonnot de Condillac‘s sensualist epistemology, which was prevalent in France at the time. At the same time, Ampère rejected the doctrine of space and time as a priori views after Kant, but retained his distinction from phenomena and Noumenon. He partly followed the teachings of his friend Maine de Biran in proving the existence of an independent material world, of God and soul. Ampère represented a hypothetical-deductive method of gaining scientific knowledge: The natural scientist establishes a hypothesis and wonders what experiments must be undertaken to support or falsify the theory. He proceeded pragmatically: Hypotheses could be freely introduced, but what was important was how successful they were in explaining nature. Later he dealt with the philosophy of nature and the pre-stabilized harmony of Gottfried Wilhelm Leibniz. In 1836, Andrè-Marie Ampère died of pneumonia in Marseille during an inspection tour at the age of 61. At yovisto academic video search, you may enjoy a video lecture on Ampere’s Law at Yale University by Prof. Dr. Ramamurti Shankar. James Clerk Maxwell and the Electromagnetic Fields, SciHi Blog, June 13, 2013. 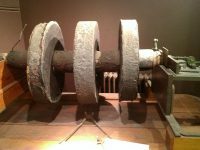 Lord Kelvin and the Analysis of Thermodynamics, SciHi Blog, December 17, 2015.